WHITE. 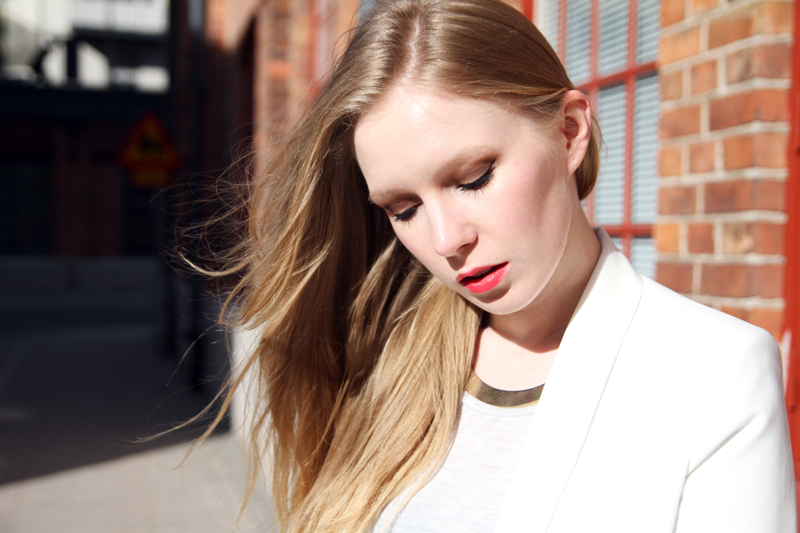 This is the second look I created for my little collaboration with Din Sko. One of the s/s 12 trends I like the most is definitely the monochrome white on white look (even though I’m one of the messiest people on earth and usually ruin anything white in less then 5 minutes, hehe). Details on what I’m wearing (besides Din Sko shoes) are in the bottom of the post! CÉLINE Audrey sunglasses. ZARA jacket. AMERICAN APPAREL pants. ZARA tee. MICHAEL KORS watch. H&M necklace. ZARA clutch. DIN SKO heels. This entry was posted in Outfit and tagged celine audrey sunglasses, din sko, monochrome, s/s 12 trends, white on white by Carolina Engman. Bookmark the permalink. Love the all white look and the clutch is perfect! Gorgeous all white outfit! Very sophisticated and elegant! Great look, very chic and elegant ! Great! There is no better partner to snake print than an all white suit. Love it! Love white on white! And it looks really well on you! You look amazing in white! I love the red lipstick, works wonderfully. I love everything of the outfit from top ’till bottom! Chapeau! LOVE an all white outfit! Great accents with the snake skin bag, red lips and gold bits! 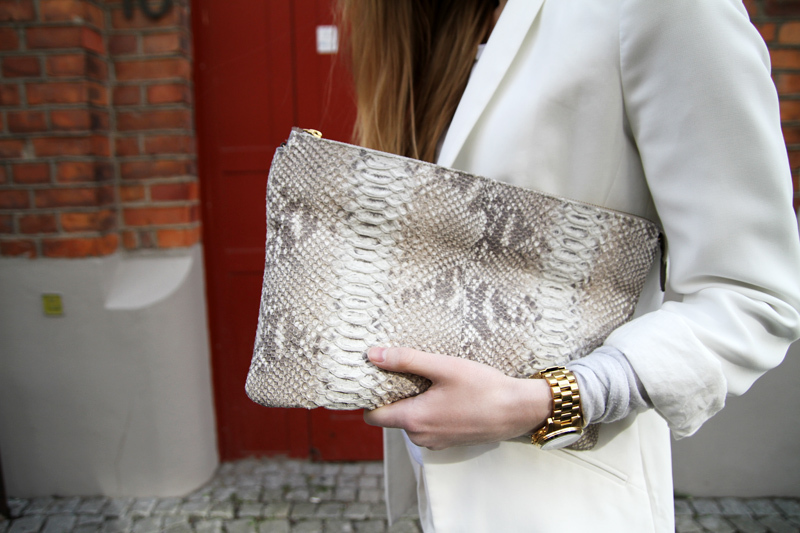 Love the white suit… you combined it perfectly with the snake print clutch bag! And the snakeskin clutch is beyond fabulousness! Oh, just stunning. So sleek and simple, but styled perfectly. Beautiful outfit, it really suits you, white on white! That white outfit is perfect! Woman in white. Love the suit! Just love your outfit..!! !So office…!! !I think the bag makes the best combination with the gold neclace improving the white outfit..!! !You make me <3 them all…!!!!! I love the white on white matched with the bright red lipstick, great look! Amazing look! Love the clutch! Love the white outfit. The monochrome make you look very chic and EXPENSIVE….. I love it! You’re so chic in white! Love everything from head to toe, I’m so into white right now! what a great all white outfit! Very refreshing and classy! A modern, ladylike look. Love the all white. Uber chic. love this all white look! its great on you! really liked the clutch ! You look simply flawless. The white on white ensemble looks great with the gold accessories. And the snake skin clutch is to die for. White color – always fantastic! Amazing combination , love white and love the bag. Nice and clean love the all white looks! I love your white in white outfit! white on white always looks so chic. You look fabulous, love the snake print detail with the clutch! Love white/white combination, it’s so chic! and the touch of gold of the watch… is just pretty!!! So beautiful and classy….love this look!! White suits you amazingly well! so awesome, you rock this outfit. You so pretty in white! It would be great that by the time you took those pics you also were wearing that Chanel white nailpolish!!! gorgeous outfit !! i love the total white outfit ! Like a Beautifull Swam!!! Incredibile questo suit bianco e la scelta della borsa magnific!!!! So chic, classy and sophisticated! You look amazing! So chic! Love an all white look! all-white ensemble at its finest!! love the look Carolina!!! Love this all white look! You look so pretty! love white! love the look! Wooow ! I love your white outfit ! Lovely white! Really like the white on white look to! Ahhh I want the whole look right now :D:D It’s amazing, just love it all! you look fabulous in white! Loving this crispy, all white look! That white suit looks great on you! Love the clutch! JUst gorgeous!! Totally love the whole outfit! ANd nice combo! Love the look, super angelic! I love pure white outfits, really nice suit. the white look is always a hit! love the phyton with all white! Siempre tan fina y elegante! un placer a la vista ver tus looks! Beautiful, Stunning model = I Love you. Love it all the way!!! I just bought an all white blazer at bleuclothing.com and i wasn’t sure how to style it. Now I know one great look for it. White is always so classic and hit. I love you entire white outfit. Very gorgeous and chic! The contrast of the bricks and your white dress looks great! White is one color I am scared to wear. I just know I would get dirty, none the less I love seeing a woman sharply dressed in a white outfit, it makes for Great Fashion. It takes guts to wear white, not only is it attention getting, but it shows the tiniest speck of dirt, which ruins a good look. Great pictures, the white outfit, shoes and handbag, are great, and I think the pink lipstick was the perfect complimentary color. Love your blog, cannot wait for good weather in my area so I can get out there myself and indulge in the latest trends, but alas as I said earlier, white is something you will not find me wearing, good for those who are brave and can pull it off. Great fashion blog loved it, good pictures. amazing! I really love thos outfit and photos! I’ve always feared clashing when it comes to monochromatic looks, but the all white outfit paired with your Zara clutch, which honestly breaks up the white and adds a pop complete with textures, is just genius and so simply striking! I love how you wear the complete white look. Great!!! !